The other day I was craving something chocolatey (like always right…nothing new). I thought about baking some cookies, but my son and hubby suggested that I make brownies, and who am I to argue with them? There’s nothing better than soft gooey brownies fresh out of the oven. It’s just pure heaven. These brownies are simply out of this world. Everything is just so perfect. They aren’t too rich, and they aren’t overly sweet. 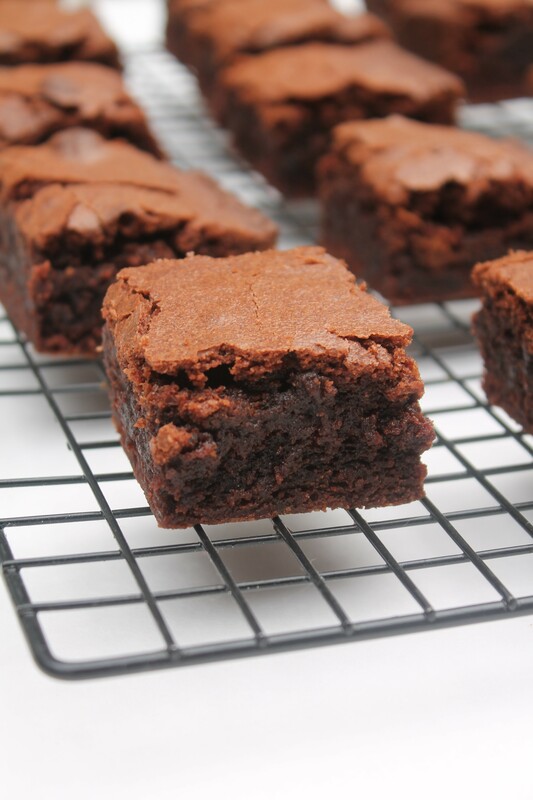 Homemade from scratch, these are THE perfect brownies. Moist and not too sweet, they're a perfect go-to dessert for any chocolate lover. Pour the melted butter into a large mixing bowl, then pour in the sugar. Mix the sugar and butter until well combined, then start adding in the eggs, but one egg at a time. Next, add in the unsweetened cocoa, and mix until well incorporated. Gradually add the flour into the bowl, then add in the vanilla extract. Mix the brownie mix until it is smooth, and lump free. Spray a 8 x 8 pan with baking spray ( you can also use parchment paper). Pour in the brownie batter into the pan, and smooth it out to make sure it's even. Bake the brownies on 350 F for about 25 - 30 minutes. Remove the brownies from the pan, and place it on a cooling rack. 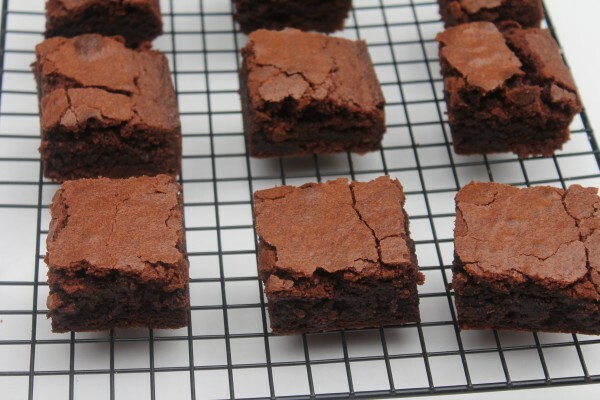 Once the brownies reach room temperature, cut them, and serve. Hey Rosie, I just posted a recipe for homemade brownies on my blog today. 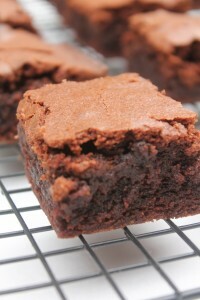 Brownies really hit the spot when you want something chocolaty, but not too fussy to make. Your recipe looks so good. I have made these two times already and my family love them thank you so much. Hi Shaneeks! Glad that you liked the recipe! I been searching for an old fashion homemade chocolate icing recipe. The kind you make from scratch and not using conf-sugar. Do you have such recipe? Or know where I can look. Thanks, keep cooking. I actually do. Check out my german chocolate cake recipe. The chocolate frosting is pretty amazing! Hi Gloria, I have a recipe coming up for it. Please stay tuned. These look so moist and delicious! I have no willpower so I have a feeling I’ll be making these often! Delish! Made them tonight and my family loves them! Wonderful and easy recipe. Thank you! Thank you for giving the recipe a try Dana! Hi Rosie. Love all your videos. Have been looking for a brownie recipe. Can I substitute the cocoa for chocolate chips? Don’t have cocoa. Thanks! Hi Rosie. I’m new to your blog, but have loved EVERY recipe so far! Thank you so much! For the brownies, the ingredients call for salt, but the instructions don’t say where to add. Please help. Thanks again! Nevermind! I saw you add the salt in the video. Sorry to bother again. Thanks! Hi Rosie. Thanks for the amazing recipes. Does it matter which flour I use (all purpose or self rising)? Sounds like you didn’t cook it long enough. Hi Rosie. Quick question… the recipe calls for medium eggs, but in the video you say that you’re using large eggs. Which do you suggest? Thx!